My dear friend ignored that I wrote “some veterans” while quoting me. Still I offer my apology and wish to clarify that I have always been proud of our Indian Armed Force Officers and Jawans and will remain proud of them all my life. If I have to pick only a single institution which is the reason for Indian Democracy to survive for 65 years, I would pick the Indian Army and a few politically motivated Generals won’t change my view. But it is also the right time to put some records straight and speak out some hard truths abruptly for the knowledge of all those who are taking high moral grounds without understanding the inherent threat. Our Armed Forces are our guarantors of freedom and they have taken every risk to uphold it. Whether real or manufactured, if they get any ‘sense of injustice’ (which currently is projected) created by some of the veterans, if goes unchecked, can destroy the fabric of the civic-military relations and will adversely affect on our freedom. Even when Soldiers were abandoned in past, patriotic veterans never spread the sense of injustice and what is happening now is very dangerous. When your Army General tells you that it is immoral to do operation like Bluestar and resists and resigns claiming his fear of alienating Sikhs who are seen as backbone of Indian Army and Indira Gandhi still pushes forward, what do you comprehend? Wasn’t that brinkmanship? That is how Indira Gandhi treated Indian Army Generals and yet she was hailed by all Faujis and rightly so. It is utterly brazen that those who quashed OROP, who stole apartments from war widows, who wanted a referendum in J&K, who wanted to remove AFSPA are standing with Army Veterans. Take a bow your shamelessness! Around this nonsense noise, no one would never come to know how an undecorated soldier Rajeev Chandrasekhar fought the battle for OROP. The son of a former Indian Air Force Officer, Chandrasekhar worked behind the scenes stepping in whenever hurdles came up in the negotiations. 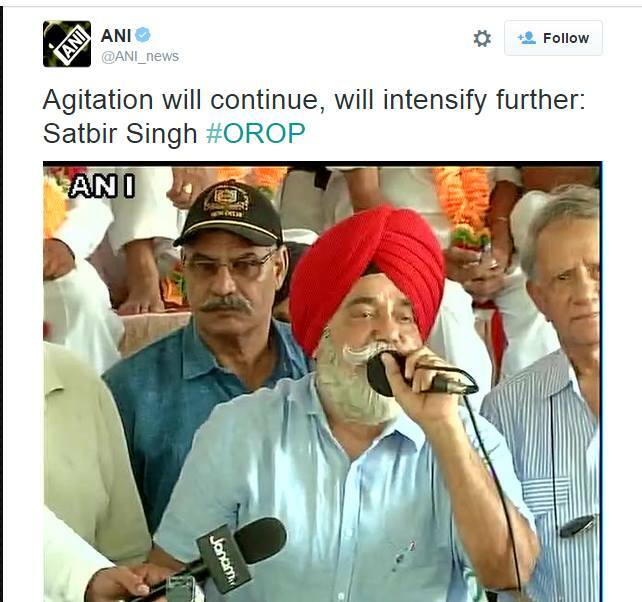 He played a crucial role in getting the agitating ex-servicemen around to agreeing to scale down their demand. He was shocked that a faction of veterans still threatening to continue agitation. In fact they knew it all along that it is only Mr. Modi, who could deliver it, hence they started protest now and not before. It is also abundantly clear that a faction of OROP leadership does not want Modi to come out looking good and forcing a showdown. I dread consequences of what politically motivated Satbir Singhs are doing by dragging the protest and bringing bad name to Army with eye on personal political milestones. Dangerous disinformation are being spread in an attempt to misguide ex-servicemen. Can anyone tell me where is the honor in this inconsistency? Dear Army veterans, one humble & sincere request from a civilian: Please do not reduce yourselves to a trade union. One even said “Bihar mein kyaa karoge. Gujarati to army mein nahi aate” shocked me. This is what AAPTardism does to you. Is this the language filled with such hate from a General who missed on becoming the COAS by a whisker? Can anyone remind the General of ten years of Sardar Manmohan Singh rule crippled all modernization initiatives, all major procurement for Armed Forces. What it has to do with dear Sardars? During A K Antony period, forget about the OROP, Govt was continuously busy fighting cases with veterans. If AK Antony was the defense minister in any other nation, he would have been tried & convicted for treason for his incompetence & negligence. Many of us are very sad that when justice is being done for the first time, our Armed Forces veterans are being misled by “politically motivated veterans”. Nobody spread the “sense of injustice” among Armed Forces for 40 years. Some people, for their political motivations, are doing irreparable damage to the apolitical ethos of Indian Armed Forces. 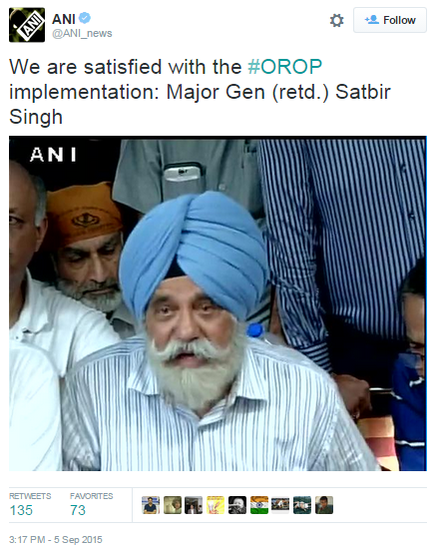 The fabric of civil-military relations in India has been bruised with this overt politicization of OROP. In my opinion, the veteran’s demands were absolutely justified and that is why the whole country trusted and supported them blindly. The decision on OROP is firm, fair, generous even if it was late and by making it political, they are risking the respect they command, which is too high a price to pay.